THE ESSE ASOKE is the highest building at Sukhumvit Road. The breathtaking tower, a contemporary modern style soars above city at 240 metres in the sky with total of 55 floor, prime land plot. With all the conveniences surrounding; business towers, renowned shopping centres, 5 star hotels, and the focal area for entertainment, this residence is set to become the pinnacle of Bangkok skyline. 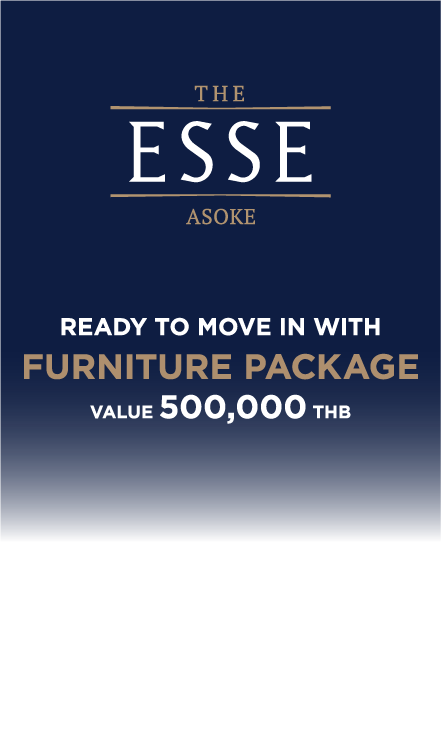 THE ESSE ASOKE delivers quality at its highest. ESSE condominium project is situated in a prominent and convenient location at the heart of Asoke road surrounded by thriving grade “A” commercial towers, shopping centres, luxurious hotels and entertainment centres. THE ESSE ASOKE define life at its finest. Asoke Montri road is known as one of the business district of Bangkok from the past, present and future, it is connected to the 2 major roads, Sukhumvit and Petchburi roads. The location is prominently satisfied with one of the leading schools and institutions, hospitals, shopping districts, and various taste of restaurants. Our team will contact you back shortly. This precious land has been passed down through the generations, as the site of the original Singha Beer House. Through determination and development, Singha Estate has built an exceptional condominium, a center of lifestyle, and a home for simply living. Access the city's best by car, BTS, MRT, or even walking. Enjoy the best in lifestyle choices including top restaurants, shopping, recreation, hospitals, and schools. SIMPLY REMARKABLE IN EVERY DETAIL. Enhance your life and lifestyle with 55 – storey of soaring urban views, iconic presence, and timeless design. LIVE SIMPLY, BREATHE DEEPLY, THRIVE DAILY. With over 1 rai of private garden space, THE ESSE ASOKE offers you exceptional amounts of green space and daily sanctuary from urban life. INCOMPARABLE AMENITIES FOR LIVING SIMPLY. Indulge in all the facilities and features your desire to complement your lifestyle. HIGHLIGHTS OF THE ESSE ASOKE. - THE ESSE ASOKE is a truly outstanding residence that will enhance your life and lifestyle, with 55 – storey of soaring views, iconic presence, and timeless design. - Exceptional privacy and elite neighborhood living is assured with a discreet, single-corridor layout and a maximum of 12 exclusive units per floor. - With more than 1 rai of exclusive gardens, THE ESSE ASOKE offers you the most green space in the central Asoke district and a daily sanctuary from urban life. Enclosed, secure car parking spaces are in excess of 100% of the resident units, with a special designated lot for supercars and superbikes. - Each unit at THE ESSE ASOKE is intelligently designed with efficient and ergonomic space usage to maximize comfort, convenience, natural light, and breathtaking views. - Interiors are meticulously finished in high-end, long-lasting materials that enhance sensations of luxurythrough quality texture and form.